2. (5/8) of (16/9) of (18/5) of 65 % of 800 =? The following bar graph shows the total number of people (Male and Female) went to a theatre in 7 different days of a week. 6. If the ratio between the total number of male to that of female went to the theatre on Monday and Wednesday is 8 : 7 and 5 : 7 respectively, then the total number of female went to the theatre on Monday is what percentage of total number of male went to the theatre on Wednesday? 7. Find the average number of people went for the theatre in the week except Sunday? 8. Find the ratio of the total number of people went for the theatre on Monday, Wednesday and Friday together to that of total number of people went for the theatre on Tuesday, Thursday and Sunday together? 9. If 45 % and 30 % of people went for a theatre on Thursday and Friday is booked AC tickets respectively, then find the total number of people booked AC tickets on Thursday and Friday together? 10. Total number of people went for a theatre on Sunday and Monday together is approximately what percentage more/less than the total number of people went for a theatre on Tuesday and Thursday together? 2) (5/8) of (16/9) of (18/5) of 65 % of 800 =? 6) If the ratio between the total number of male to that of female went to the theatre on Monday and Wednesday is 8 : 7 and 5 : 7 respectively, then the total number of female went to the theatre on Monday is what percentage of total number of male went to the theatre on Wednesday? 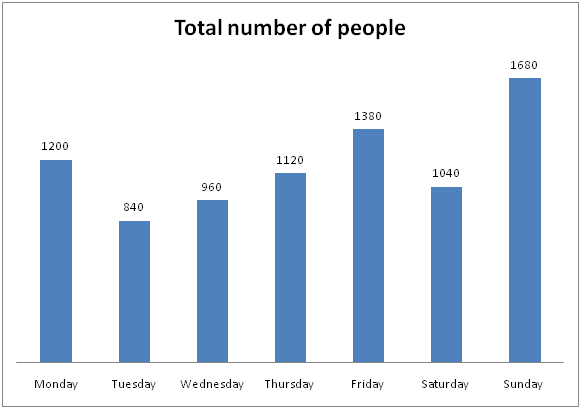 7) Find the average number of people went for the theatre in the week except Sunday? 8) Find the ratio of the total number of people went for the theatre on Monday, Wednesday and Friday together to that of total number of people went for the theatre on Tuesday, Thursday and Sunday together? 9) If 45 % and 30 % of people went for a theatre on Thursday and Friday is booked AC tickets respectively, then find the total number of people booked AC tickets on Thursday and Friday together? 10) Total number of people went for a theatre on Sunday and Monday together is approximately what percentage more/less than the total number of people went for a theatre on Tuesday and Thursday together?